Abstract | Smallholder or resource-poor farmers in a tropical country, such as Pakistan, are often the cause of environmental degradation and at the same are impacted by it. More than 80% of the farmers in Pakistan are resource-poor or practice subsistence farming which degrades the environment. Therefore, there is an urgent need for climate smart extension education for these farmers. The main purpose for this study was to examine environmental degradation/climate change associated problems faced/ perceived by resource-poor farmers and ways adopted to mitigate them. The specific objectives of study were to determine farm damages of resource-poor farmers under environmental degradation; explore mitigation strategies available for resource-poor farmers; and examine the implications for extension educations in Pakistan. The survey of 120 farmers was conducted in the Punjab Province of Pakistan, covering 36 districts and across three of the ten agro ecological zones of the country. Rice, cotton and mix-cropping are practiced in these zones. The findings show that maintaining soil fertility and controlling livestock diseases were the main challenges resource-poor farmers face while water conservation and climate smart agricultural practices were proposed as the main mitigation strategies. Educating resource poor farmers on the causes and consequences of environmental degradation is relatively new in Pakistan. With these farmers constituting the vast majority of the agricultural population there is an urgent need for extension to come to their aid. Climate smart agricultural practices should be integrated in extension training and practice in Pakistan. Citation | Talib, U., I. Ashraf, R. Agunga and S. Ashraf. 2019. Resource-poor farmers and environmental degradation in Pakistan: How extension can help. 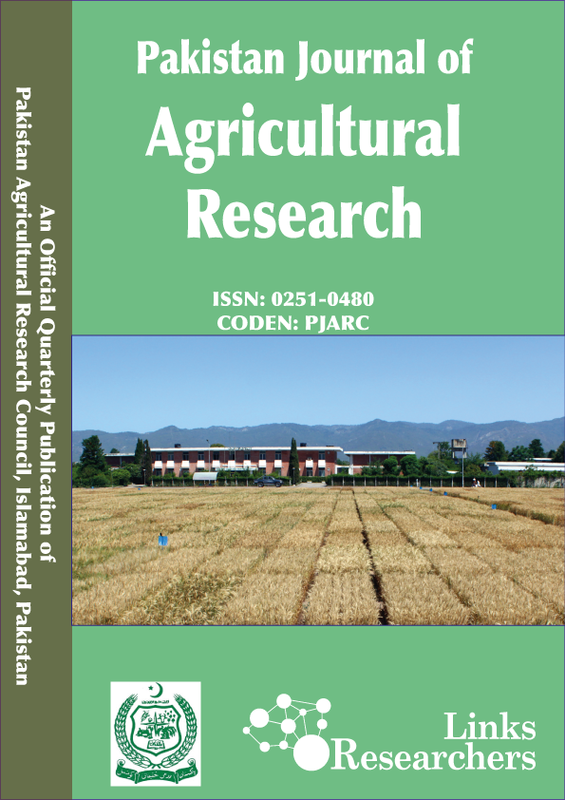 Pakistan Journal of Agricultural Research, 32(1): 110-114. Agriculture is the mainstay of Pakistan’s economy and an overwhelming majority of the farmers (80%) are resource-poor (Abbas, 2010). These are small landholders with farm sizes averaging 2 hectares (5 acres) or less (USAID, 2011). A major problem faced by these farmers is environmental degradation, particularly, deforestation or denuding of the vegetation through excessive cropping on hill slopes and over grazing of livestock. Deforestation contributes 23% of man-made carbon dioxide (CO2) emission in Pakistan. The country emits 0.01% of the world’s CO2 and is ranked 135th in the world in terms of environmental degradation (Shakoor et al., 2011). Unbeknown to many people, the war on terror degrades much of the agricultural land in tribal areas due to explosive chemicals and stockpiles of ammunition being washing down the rivers and into agricultural lands (Ashraf and Iftikhar, 2013). About 25% of the land or 6,000 acres is degraded annually through water logging (-8.9 mhec), salinity (-6.3), and water erosion (-11.2mhec). The biggest source of power generation is thermal energy in which thousands of tons of oil, gas or coal are burnt annually to meet domestic needs (Hammad, 2011). There is a strong relationship between environmental degradation and low production by resource-poor farmers. There is also strong evidence that the warming of the earth over the last half-century is caused largely by human activity, such as the burning of fossil fuels and changes in land use, including agriculture and deforestation (WWF, 2007). A bulging population growth means the need to clear more land for food production and rapid industrialization also means creating’s more pollution, especially in emerging industrializing countries like Pakistan and India through using crude industrial equipment. Coal as an energy alternative pollutes the environment far more than any other factor. In the US coal accounts for 56% of energy source; in China, it is 70%; 47% in India and in Pakistan only7.4%, but this is enough to degrade environment if measures are not taken (Campball et al., 2013). The UN environment protection agency states that depletion of the ozone layer in 20th century is worse than all previous damages (McSweeney et al., 2012). Environment degradation in Pakistan can also be blamed on regional factors. For example, Pakistan is sandwiched among China, India, Iran and Afghanistan (Janjua, 2014). China is the most populous country and the highest emitter of CO2 in the world and Pakistan suffers as a result of its proximity. India is also the 2nd most populous country and an emerging industrialized country, with 47% of its energy source coming from coal (National Climate Change Policy [NCCP], 2011). These issues not only pose a great threat to regional climate but also contribute to global environmental degradation. The US/Afghanistan war on Pakistan’s western border exacerbates the problem. Daily ammunition firing from both sides releases waste that flows into Pakistan (Khan, 2010). Janjua et al. (2011) noted that Pakistan is more vulnerable to climate change because of its geographic location. They reported further that repercussions of anthropogenic activities, escalating temperature of the earth, deforestation and desertification of agricultural land are visible in the form of reduction in crop productivity, increased wind, water erosion, soil salinity and water logging. 1. To determine farm damages of resource-poor farmers under environmental degradation. 2. To explore mitigation strategies available for resource-poor farmers. 3. To examine the implications for extension education in Pakistan. A survey research methodology was applied in the study. The processes included: identifying the study area, defining the population and drawing a sample, instrumentation and data analysis. There are 4 provinces of Pakistan: Punjab, Sindh, KPK and Baluchistan. Punjab province was selected for two reasons. First, there were more resource-poor farmers in this province than in other provinces, and secondly, it was the most effected province in terms of environmental degradation. For example, there was an earth quake occurrence in 2005, followed by devastated floods in 2010 and 2011 (GoP, 2015). The study was conducted in Gujranwala and Multan Districts because they have the best lands for rice and cotton crops cultivation. Randomly 120 resource poor (60 from each district) farmers were selected as respondents. An interview schedule was developed by keeping in mind the research ethics and used for data collection. The interview schedule was pre-tested before final data collection. The validity of research instrument was also checked by asking questions to the farmers. The reliability was checked by using the Cronbach alpha test. A five point-Likert scale was used. Qualitative research methods, i.e. focus group discussions (FGDs) and personal observation were also used in this study. There were 6 FGDs consisted on 6-10 farmers interviewed for in-depth study. The discussions were recorded by mobile phone. Collected data were analyzed through computer software Statistical Package for Social Sciences (SPSS) for tabulating results and drawing conclusions and recommendations. Average mean and standard deviations were also computed for better understanding of the data. All expenses for the study were born by the researcher. The results are drawn on the responses of 120 resource-poor farmers in Punjab province. The objective was to determine farm damages, such as loss of soil fertility, manifestation of livestock diseases, soil erosion, livestock access to food and water, drought, availability of irrigation water, plant diseases and soil salinity. Table 1 is resource-poor farmers’ declaration on farm damages experienced under environmental degradation. Table 1: Farm damages caused by environmental degradation. Responses: 1: very Low; 2: Low; 3: Medium; 4: High; 5: very High. The data in Table 1 depicts the loss of soil fertility was ranked 1st with mean value of 3.80 as the most significant farm damage caused by environmental degradation. The increase in livestock diseases and soil erosion ranked 2nd and 3rd with mean values of 3.58 and 3.30 respectively. The decrease in access to food and drinking water for livestock placed 4th in deleterious damages with mean value of 2.90. An increase in drought condition rated between low to medium range with inclination toward medium (2.56) and rated 5th among various farm damages. An increase of non-availability of irrigation water, plant diseases, and soil salinity are tending toward lower point (2) and graded 6th, 7th and 8th respectively. The objective 2 explored the adaptation strategies, including water conservation, climate smart agri. practices, disease resistant animals, mulching, diversified farming, zero tillage, organic farming, crop rotation and water harvesting. The researcher asked the resource-poor farmers about what you do to mitigate the impacts of environmental degradation. The responses are presented in Table 2. Table 2: Farmers’ mitigation strategies against environmental degradation. Responses: very Low; 2: Low; 3: Medium; 4: High; 5: very High; X: No Response. The data in Table 2 illustrates the different adaptations by the farming community against environmental degradation. Water conservation through all possible means is a very highly adapted farming practice to confront the climatic variation and was ranked 1st with mean value of 4.07. The second practice by farming community was raring of disease resistant animals, which had a mean value 3.35. Other mitigation strategies like mulching, diversified farming and zero tillage falls between medium to high category with inclination toward medium value (3). Similarly, organic farming and crop rotation were ranked 6th and 7th with mean values of 2.64 and 2.37 respectively. Water harvesting was considered the least method of farming practice with 1.48 mean values and ranked 8th. The objective 3 explored what extension worker can do to help farmers experiencing damages under environmental degradation seeking mitigation strategies. There were 2 questions under this objective. First, was the degree of farmers, acquaintance or contact with the extension staff? The extension staff was a) District officers of Agricultural Extension (DOAE), b) Agriculture Officers (AO), and c) Field Assistants (FA); and their contact or acquaintance with farmers classified into: a) by face only, b) by name only and c) both face and name. The responses are presented in Table 3. Table 3: Farmers, acquaintance with the extension staff . Scale: V poor (10-20%); Poor (20-40%); Fair (40-60%); Good (60-80%); V good (80-100%). Table 3 depicts that acquaintance of the resource-poor farmers with extension staff in the district. The data show that on an average 39 (32.2%) small scale farmers acquainted by face with extension staff; 21 (17.5%) with DOAE, 43 (35.8%) with AO, and 53 (43.3%) with FA. Generally, 35 (29.5%) respondents were contacted with extension staff by name; 45 (37.5%) with DOAE, 35 (29.2%) with AO, and 26 (21.7%) with FA. Twenty six (21.3%) respondents were familiar with extension staff both by face and by name; 13 (10.8%) with DOAE, 24 (20.0%) with AO, and 42 (35.0%) with FA. The Second question was: what is the frequency of visits paid by the extension staff? The frequency of visits was classified into a) weekly, b) fortnightly and c) monthly. The responses are presented in Table 4. Table 4 is about the frequency of the visits of the extension staff to the resource-poor farmers. The data show that on an average 13 (11.1%) small scale farmers argued that extension staff visited them weekly; 17 (14.2%) by AO, and 23 (19.2%) by FA. Generally, 27 (22.5%) respondents were fortnightly visited by extension staff; 8 (06.7%) by DOAE, 34 (28.3%) by AO, and 39 (32.5%) by FA. Forty five (37.5%) respondents were visited on monthly basis; 21 (17.5%) by DOAE, 56 (46.7%) by AO, and 58 (48.3%) by FA. Table 4: Visit’s frequency of extension staff. The results revealed that loss of soil fertility and increase in livestock diseases were the worse farm damages caused by environmental degradation to small landholder farmers. Increase of soil erosion is the third most dangerous cause of environmental degradation followed by scarcity of food and drinking water for livestock, an increase in intensity of drought condition and decrease of irrigation water availability. The intensity of plant damages and soil salinity are the least farm damages caused by environmental degradation. Conservation of water is the leading mitigation strategy of the rice and cotton growers to control climatic variations to feed the crops and animals in the Punjab, Pakistan. The raring of disease resistant animals was the second most preferred farm adaptation methodology of resource-poor farmers. The field mulching, diversified farming and zero tillage are the medium range adaptations by the farmers. Organic farming, crop rotation and water harvesting were the least practiced by resource-poor farmers. The results of 3rd objective revealed that farmer’s acquaintance of extension staff and visit frequency to resource-poor farmers were poor (20-40%) with inclination towards very poor (0-20%). Qualitative data illustrated that deforestation, lack of water reservoirs, bulging of population, and war on terror were main causes of environmental degradation. Rapid urbanization and industrialization were also effect agricultural practices. It was observed that rice zone is less affected by floods than cotton zone. Its cropping intensity is also more than cotton zone, which protect its soil from erosion. Water quality in cotton zone was poorer than rice zone because of more use of fertilizer and pesticide. The livestock health in cotton zone is also not as good as of rice zone. It is also concluded that there is no life without water. Therefore, farmers must adopt water conservation for crop and livestock use. Due to increases in population, increased cropping intensity ultimately decreases soil fertility. Thus, it pushes farmers to find ways of crop rotation, organic farming, zero tillage and water harvesting, etc. It is observed that educated farmers are more interested in advance agricultural practices to cope with climatic changes, i.e. zero tillage, climate smart practices, soil and water conservation etc. It is also noticed that every farmer in one or other way busy in combating climatic variation. On the basis of these conclusions following practices are recommended. This study set out to assess resource-poor farmers, concern with environmental degradation in Pakistan. A survey of 120 resource-poor farmers in cotton and rice zones of the Punjab province depicted that loss of soil fertility is the most deleterious farm damage caused by environmental degradation with water conservation as the best mitigation strategy for smallholder, resource-poor farmers. Given these findings, personal observations and discussions with FGDs, the following recommendation is made. The study found that farmers acquaintance is poor with extension staff. If extension staff is not in contact with small scale farmers, to whom they can tell their farm damages. Therefore, it is suggested that government should ensure contact of extension staff with small scale farmers. Keeping in view high farmer-to-extension staff ratio, government should introduce modern contact means, i.e. ICTs (mobile, internet, social media, etc.). It is also found that frequency of visits the resource-poor farmers is also poor. If extension staff doesn’t visit farmers then who will inculcate mitigation strategies to resource-poor farmers like the farmers face water scarcity but they were less practicing water harvesting strategy. So, it is suggested that government should provide motor vehicles to extension staff, which will improve their capacity to visit the farmers. Umair Talib prepared the questionnaire, conducts survey, analyze the data, and wrote the manuscript. Ijaz Ashraf was involved in questionnaire preparation and supervision of survey research. Robert Agunga critically analyzed, revised, edited and finalized the manuscript. Abbas, A.M. 2010. General Agriculture. 5th ed. Emporium publisher 22-Urdu Bazar, Lahore, Pakistan. Ashraf, S., and M. Iftikhar. 2013. Mitigation and adaptation strategies for climate variability: a case of cotton growers in the Punjab, Pakistan. Int. J. Agric. Ext. 1(1): 5-11. Campbell, J.R., P. Folger and P. Brown. 2013. Prospects for Coal in Electric Power and Industry. Prospects Coal Electr. Power Indus. pp: 1-21. GoP. 2015. Economic Survey of Pakistan: Economic Advisor’s wing, Finance Division, Islamabad. Hammad, S.P. 2011. Golden notes current affairs and essays. Composed by student composing and photo copy center university of Punjab Lahore, Pakistan. Janjua, M.H. 2014. Environmental degradation in Pakistan. Published in Jahangir World Times May 2014. 7(3): 22-29. Janjua, P.Z., G. Samad and N.U. Khan. 2011. Impact of climate change on wheat production; a case study of Pakistan. Online available at: www.pide.org.pk/psde/25/pdf/.../Pervez% amurrad anjua.pdf. Khan, K.F. 2010. Pakistan geography, economy and people; Endorsed by University of Cambridge International Examinations. Oxf. Press, UK. National Climate Change Policy [NCCP]. 2011. Government of Pakistan; Ministry of Environment, April 2011. pp: 131-136. Shakoor, U., A. Saboor, I. Ali and A.Q. Mohsin. 2011. Impact of climate change on agriculture: empirical evidence from arid region. Pak. J. Agric. Sci. 48(4): 327-333.